LakewoodAlive’s Housing Outreach Program announces the return of its Paint Lakewood Program for the 2018 season. This innovative program is designed to help make it more affordable for qualified Lakewood homeowners and residents to beautify their homes through exterior whole-home painting. Paint Lakewood will provide a grant of up to $3,500 to Lakewood homeowners and residents for exterior paint, supplies and professional labor costs to paint their home. The program has been designed to offer a grant on a sliding scale to help reduce the cost of an exterior paint job. The Paint Lakewood Program’s primary goal involves revitalizing Lakewood’s neighborhoods while reducing lead hazards and educating residents on lead safety issues. Qualified Paint Lakewood Program applicants must meet HUD-established income guidelines, and other restrictions do apply. Visit LakewoodAlive.org/PaintLakewood for more information or contact the LakewoodAlive office at 216-521-0655. 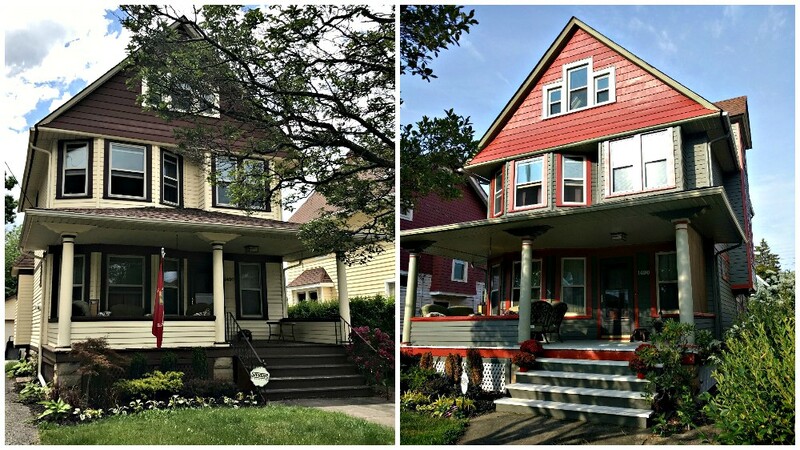 Before and after photos from a home that was painted as part of the Paint Lakewood Program.